If you’re like me, you have a TON of those old “circular tip” shaped Lenovo Power Adapters. They were used for the ThinkPad laptops like the ThinkPad X201T convertible tablet/laptop. I have 6 of these old adapters & as a result, I’ve been using these 3rd party adapters that convert these old style power adapters to the new interface used by the ThinkPad X1 Carbon Touch. Here’s the listed specs. I don’t anything about this company. All I know is that I bought 4 of these and they all work beautifully with my old power adapters. Saves me a ton of money by reusing my old accessories on my new laptop. I leave them around at the office, home, and in my bag now. Adapter for Lenovo ThinkPad X1 Carbon 0B47046 Laptop. Length: 7" (7 Inch) long. 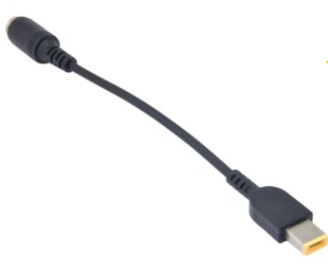 Connector：one side is 7.9×5.5mm female plug, another side is Square male plug for X1 Carbon Ultrabook.